As the Kansas Legislature begins a “wrap-up” session, how big is the budget gap that must be closed in order to adequately fund schools and repair the state’s dismal financial situation? Recent revisions to the general fund revenue forecast predict tax collections to be about $50 million a year higher than previously expected. That’s helpful, but Kansas still faces a huge structural budget imbalance without any reserves to draw on. Following the release of the revenue estimate, media reports pegged the budget gap at $900 million over two years ($450 million annually). However, that calculation did not add anything to cover new spending for school finance, and assumes that $300 million will still be taken each year from the highway fund. FY 2017 (July 1, 2016 to June 30, 2017). Apply the new revenue forecast to the almost completed FY 2017. Recurring revenue** calculates to roughly $5.7 billion. But the budget for FY 2017 that lawmakers approved spends about $6.3 billion, $600 million above recurring revenue. To close that gap, lawmakers diverted $300 million from the highway fund to the general fund. And they authorized loans to borrow another $300 million, with a portion of the borrowed money to be repaid over the next 6 years, and a portion over 20 years. Also, $80 million of unpaid FY 2016 school bills that were shifted forward to be paid in FY 2017, will be shifted forward again. None of the FY 2017 “gap fillers” actually fix the state’s financial problems. In fact, they make financial problems even worse in future fiscal years. FY 2018 (July 1, 2017 to June 30, 2018). Now consider FY 2018, the key fiscal year for which lawmakers must create a budget. Using the revised revenue estimate, recurring revenue again stands close to $5.7 billion. Lawmakers have not yet finalized spending for FY 2018, but both the House and Senate are headed toward a budget that spends more than $6.4 billion once required payments to KPERS are factored in. However, that $6.4 billion figure does not yet address the increased spending needed to fix school finance. The leading school finance bill under discussion adds $150 million to expenses each year for 5 years, eventually appropriating $750 million more for schools annually. Adding the first $150 million installment for school finance puts likely FY 2018 expenses almost $900 million above revenue. FY 2019 (July 1, 2018 to June 30, 2019). In FY 2019 “recurring revenue” calculates a bit higher, between $5.7 and $5.8 billion, but expenses will be higher too. Add the second-year $150 million school finance installment, and the FY 2019 structural gap goes over $900 million. To structurally balance the budget and meet education obligations, Kansas needs a revenue reform package that produces at least $900 million annually. Without a realistic solution, Kansas will continue to drain its highway fund, borrow, become poorer, and put the public education system at risk. 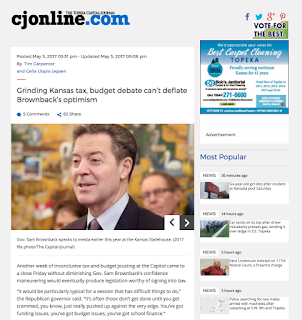 The 2012 income tax cuts are the root cause of these crippling financial problems in Kansas. Rolling back the Brownback tax plan remains the simplest and best solution. ** Recurring revenue is essentially the net income that can be counted on each year to pay for general fund expenses. Here’s a simple calculation of recurring revenue for FY 2017: Kansas expects tax revenue of $5.746 billion. From that, subtract $180 million for the state’s share of school construction bonds. (Though this cost should be shown as an “expense,” it is instead counted as a “transfer” or “reduction to revenue.”) Then add in interest income of $64 million, and agency earnings of $77 million. That very roughly brings FY 2017 recurring revenue to $5.7 billion.